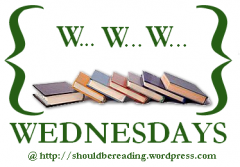 WWW Wednesday is hosted each week at Should Be Reading. You’d think being a privileged Prince in a vast intergalactic Empire would be about as good as it gets. But it isn’t as great as it sounds. For one thing, Princes are always in danger. Their greatest threat? Other Princes. Khemri discovers that the moment he is proclaimed a Prince. He also discovers mysteries within the hidden workings of the Empire. This story certainly dumps you in the technical deep end right away, with plenty of society-building and information overload in the first few chapters. The next few chapters have been a little more action-oriented and pretty good so far! The very brave and adventurous Ellie, as she would like to be described, and the always sensible and logical Thomas, move, with their parents, to a forsaken farmhouse due to falling on hard, economic times. But there is a reason this farmhouse was abandoned. Ellie and Thomas discover perplexing carvings, travel to a troubled mythical land and have encounters with incredible creatures. A very sweet fantasy story for children. Watch out for my review, coming very soon. Greedy thieves have stolen the children’s dreams! And not just any dreams, mind you, but the Dreams of whom they are to become. With this loss children everywhere are becoming cross, and more misbehaved by the day. They are driving their parents mad. Left alone in their Village, it’s up to twelve, brave, Elf children to undertake a long and hazardous journey, and try to get their Dreams back. I’m in a bit of an ARC-lull this week, which means I get to catch up on my to-read pile a bit! 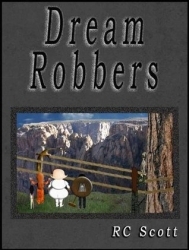 I received an e-copy of Dream Robbers from the author for review. It sounds like a great story. How about you? Link me your WWW, or tell me what you’re reading! 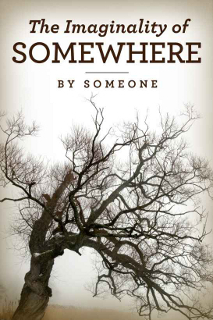 The Imaginality of Somewhere sounds really awesome I’ll be interested to read your review! It wasn’t as awesome as I had hoped, actually, but still very cute and I think kids would still love it. I’ll probably post my review next week. 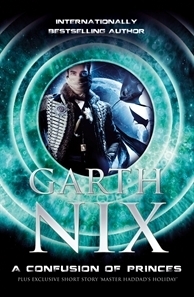 Haven’t read anything by Garth Nix previously, but I’m very interested in picking up A Confusion of Princes.